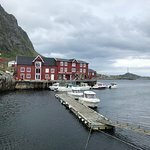 Get quick answers from Lofoten Hostel A staff and past guests. "If you do not mind rising early, ask for sea-view rooms. Otherwise, rooms overlooking the mountains do not..."
"Try the Fish Museum building or one of the Rorbuer"